When a loved one dies, all you need to do is make one phone call. From that moment on, we'll take on the responsibilities of the physical care of your loved one and the emotional care of those left behind. During this difficult time, there are decisions to be made immediately, arrangements to be coordinated, and a lot of things to be considered for your loved one's final farewell. We understand how this may feel overwhelming, especially with the grief you're feeling over the loss. Please know that we are here to help and support you. On this page, we've put together some information to help guide you through the process. Always feel welcome to call our San Marcos Chapel at 760-744-4522 or our Vista Chapel at 760-726-2555 if you have other questions. Can I make arrangements before a death occurs? Yes. Making arrangements prior to a death helps alleviate some stress and burden from your family, allowing them to cherish the memories rather than plan the details. Our Pre Planning page will answer many of your questions. Please feel welcome to call us in Vista at 760-726-2555 or in San Marcos at 760-744-4522 to schedule a no-obligation appointment with one of our Preneed Consultants or fill out our preplanning on-line form to have one of our Consultant contact you as you request on the form. Please call usimmediately at either 760-726-2555 or 760-744-4522. One of our Allen Brothersstaff is available by phone 24-hours a day, 7 days a week to guide youthrough the entire process. You'll never get an answering service or amachine. We're just a phone call away when you need us and we're here tohelp! By calling us first, we can help take care of many of the details torelieve some of the stress you will be feeling at this time. ﻿ Our caringfuneral director/arrangement counselor will collect information from you tofacilitate the transfer of your loved one’s remains to our facility. You wouldalso be asked if the deceased has made pre-arrangements and whether or notyou’d like for him/her to be embalmed. While of course you can ask anyquestions you have in your mind during this call, note that once you visit thefuneral home, we can discuss the arrangements in greater detail. If the deathoccurs outside the San Diego area, contact us first. 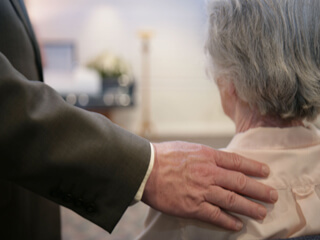 We will locate alocal funeral home near the place of death and arrange for preparation andtransportation of your loved one back to our funeral home on your behalf. We can also help coordinate with the other funeral home if you are planning tohave a service there before bringing your loved one here. If the deathoccurs locally but the deceased has chosen burial in another county, state orcountry, we will handle those arrangements for you as well. You also havethe option of having services here for local friends and family to celebrateyour loved one's life before transportation to the chosen burial location. Our Resources "Forms" page has a "Decisions to Make- Actions to Take" checklist to help you gather your thoughts. Ourstaff will assist you through all of these items so don't hesitate to askquestions. When we will meet with the Funeral Director/Arrangement Counselor? During your first call with us, we will ask you when you would like to come in to meet for your arrangement conference. We will schedule a time that is convenient for you and other family members who will be joining you. On your first meeting with us, we will discuss the arrangements for yourloved one’s burial. You will be shown a list of our packages/services, so youcan decide what suits your family’s preferences and budget. You will be askedwhether you’d prefer burial or cremation arrangements and optionally you wouldselect a casket, schedule a time and date for the services, decide on thelocation of the burial, draft an obituary notice, arrange for vehicle services,and select pallbearers. When you first call us, you will probably answer a few general questions about funeral plans - some vital statistics about your loved one, whether there was a prearrangement or a will, the decedent's or family's preference for burial or cremation, and possibly your thoughts on what services you'd like to hold. Plans will be finalized when you meet with our staff at a time convenient to your schedule. The following list does not include everything, but it is a general list of things you may want to bring with you to the arrangement conference. Vital information about the decedent--date and place of birth and death, parents' names, names of pre-deceased relatives and survivors, Social Security number, dates of marriages/divorces. Please feel welcome to print our Vital Statistics form to help you organize this information. Military information including separation or discharge papers (Form DD-214 or equivalent), if the deceased was a veteran. Any information related to a pre-arrangement, if applicable, whether made with Allen Brothers or another funeral home. Information on the place of burial or final disposition if a cemetery plot or niche has been purchased. Photographs - one or two recent photographs that will be used during the embalming and cosmetizing process. Names and phone numbers of clergy or celebrants you wish to involve in the ceremonies. Records of life insurance policies - we can contact the company for you to request the required documents be sent to you. Our staff will meet with you, listen carefully, and explain the many options available to create a individualized and memorable service for your loved one. Do not worry about forgetting something to bring to the arrangement appointment - there will be time for you to get us any missing information and we will help you through each step. If pre-arrangements are on file with Allen Brothers, we will review the arrangements with you and follow the wishes of the deceased. If not, we will assist you every step of the way. If your loved one prearranged his/her funeral with another funeral home and you wish to transfer the arrangements to us, please let us know. We can contact the other funeral home, on your behalf, to arrange the transfer of documents and funds. How many days after a death before we have to schedule services? In general, the deceased must be embalmed, refrigerated, buried, or cremated within 24 hours of death. Normally a funeral service is held a few days after the death, but many factors can come into play when deciding the actual day of the service. Our staff will contact the doctor for necessary paperwork, obtain the permits for the disposition (either burial or cremation), make arrangements with clergy, church, musicians, and cemetery if applicable; all of these steps take time. Other things, such as travel time for out-of-town relatives, avoiding specific dates (such as holidays, family birthdays, and/or weekends) also should be considered. It is important to allow enough time to accommodate everything that needs to be done so that you do not feel rushed and you have the time you need. With cremation, you generally have more time in scheduling the service. The actual process of cremation will generally occur within 2 to 4 days after the proper permits are obtained from the County Health Department where the death occurred. However, a permit is not required to have a public viewing of the deceased or to have the body present at the funeral service. The permit is only needed prior to the actual cremation. What type of services are available? Allen Brothers Mortuary is a full service mortuary; whether you choose burial or cremation, our staff can personalize your choices for services. You may choose a service, with or without a visitation/viewing, in our chapel, at your church, or at the graveside. The term "funeral" describes a service with the body present. This service, sometimes called a "traditional funeral", can be held whether the final disposition will be burial or cremation after the funeral. A funeral service can be held in our one of our chapels or at your church, synagogue or mosque. Clergy may, or may not, lead the service at either location, depending on your preference. Often, families offer the opportunity for relatives and friends to share memories of their loved one at some point during this service. The words "viewing," "visitation," and "wake" are generally synonymous terms for an informal gathering that precedes the funeral. Traditionally, it takes place the day before the funeral, but many families today will hold same-day visitation and funeral services. Often, the deceased is embalmed and in an open casket, but the casket may be closed or not present at all, depending on your choice. This ceremony is an informal time for relatives, friends, and colleagues of the deceased to stop by and offer condolences to the family. A visitation typically lasts for several hours, allowing people to arrive, share a fond memory and kind words with the family, and depart as they wish. Flower arrangements that have been delivered to the chapel will be displayed during the visitation and again at the funeral or graveside service. The terms "memorial service" or "celebration of life" are used for a special service that takes place without the body of the deceased present. Memorial services can be held in our chapel, your home, or any location of your choice. They can take place just a few days after the death of a loved one, or even weeks or months later, allowing the family to make time for distant relatives to travel or to reserve space at a special venue of their choice. As cremation has increased in popularity, so has the idea of a memorial service. Sometimes the cremated remains will be present in a decorative urn. However, memorial services are not exclusive to cremation - many families will hold a memorial service after the burial has taken place. A memorial service can be held in conjunction with other services, like a visitation or funeral, or it can be the only service held to honor the life of the deceased. Please see our Services & Prices page for a description of our various burial and cremation packages; all may be customized and personalized to meet your family's individual needs and choices. Can you provide a minister if we don't have one? Yes. We have many ministers who are available to work with the families we serve. We work with all faiths to insure that each family's needs are met with respect, sensitivity, and dignity. We will also arrange a meeting between the clergy and family members before the service to help personalize the service to meet the family's wishes. For a listing and links to churches in the San Marcos and Vista areas, please visit our Resources "Local Links" page. How do I get certified copies of the death certificate? Certified copies of the death certificate are issued by the County Health Department where the death occurred. When you come in to make arrangements, we will help you determine the quantity you may need and order them for you. The state does charge a fee for each certified copy ordered. We will order this initial number of certificate for you and add them to your contract under the cash advance items. Our Resources "Forms" page has a checklist you can print out in advance to help you determine how many copies you may want to have us order. If you find that you need more copies at a later time, you can order them directly from the County Health Department. You can place your order on-line for most counties or Allen Brothers staff will be happy to provide you a printed form to send in with your payment. You will receive the certificates more quickly if you place the order directly with the County Health Department, but rest assured, we will assist you in any way, including placing the order for additional certificates for you. We will then notify you when the additional certificates arrive at our chapel. The cost of a funeral will be determined by you and your family as you make your selections from three basic areas: professional service fees, casket/urn cost and cash advance items. Some costs are basic to every funeral. Costs will include the facilities and services of a mortuary staff member who handles all the legal documents (death certificate, permit, VA, Social Security and insurance forms, etc.) and makes many detailed arrangements on your behalf, including coordinating your service location, minister, florist, cemetery or crematory, newspapers obituaries, any other items necessary for your specific arrangements. Seeing to all these necessary details and assuring that your service goes smoothly takes time and a professional staff, all of which are included in the total cost. Your choice of merchandise items and cash advance items (outside fees) can also add to the funeral cost. Please check our Services and Prices page for more detailed information. How does one pay for the funeral expenses? Funeral expenses may be paid with cash, check, or credit card. For your convenience, Allen Brothers Mortuary accepts Visa, MasterCard, Discover Card and American Express. You may also use life insurance. If this has been your plan for your life insurance policy, please know that the beneficiary is not required by law to use the money for the funeral expense. Allen Brothers Mortuary also accepts funding vehicles, such as "Great Western", "National Life Insurance (NGL)", and "Homesteaders" to name just a few. Under these programs, you make pre-arrangements for a funeral service and take out funeral expense insurance. The insurance is used to pay the funeral expense at the time of death. Please see our Pre Planning page for more information. Families who may need additional assistance covering expenses can ask about our optional Funeral Fundraising program. How do I find out about Social Security benefits? Allen Brothers Mortuary will make the initial notification to Social Security for you; however, you must contact them to apply for any benefits you may be entitled to receive. You may apply at any Social Security office or by telephone. Our Resources "Forms" page has more information on who is eligible to apply for survivor benefits. The toll free telephone number for Social Security is 1-800-772-1213. The operator can schedule an appointment for you at a local office or arrange for the local Social Security office to take your claim by telephone. You may also visit the Social Security Administration website for more information. Veteran benefits vary depending on many factors. Please visit our Veterans page for more detailed information. Our Allen Brothers staff will assist you in applying for benefits for your loved one, scheduling burial in a national cemetery for all eligible veterans, their spouse, and minor dependents, if this is your choice, and scheduling Military Honors for your Veteran. You may also contact the Veterans Affairs Office to determine what benefits may be available to you at their toll free number 1-800-824-1000 or visit the Veterans Affairs Office website for more information. The closest national cemeteries are Fort Rosecrans National Cemetery and Miramar National Cemetery in San Diego and Riverside National Cemetery near the March Air Force Base in Riverside. Our Veterans page also has a link to locate all national cemeteries. The Department of Veterans Affairs' (VA) National Cemetery Administration maintains 131 national cemeteries in 40 states (and Puerto Rico) as well as 33 soldier's lots and monument sites. Please note that there is not a VA national cemetery in every state. Do mortuaries have to be licensed? Allen Brothers Mortuary, Inc., Vista and San Marcos Chapels are licensed through the Cemetery & Funeral Bureau, which regulates and licenses funeral homes, funeral directors, and embalmers for the State of California. For your convenience, you can view The Consumer Guide to Funeral and Cemetery Purchases on-line; you will also receive a written copy when making your arrangements. Are there any grief support services? Yes. The grieving process does not end just because funeral services have concluded. There is no time limit on grief and it is a very individualized process. Family and friends can be supportive, but only you can determine what will help you through this step in your life. Please visit our Resources - "More Links" page to view links to local and national support services. You may opt-in for our daily grief support program. By providing your email, you will receive a brief daily grief support message. You can unsubscribe at any time. You may also check with your physician or clergy for more resources. Remember, effects of grief can be both emotional and physical, and every individual grieves in his or her own way. Never hesitate to ask for help.